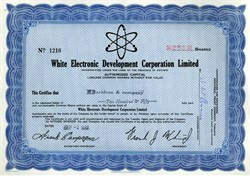 Beautifully engraved stock certificate from the White Electronic Development Corporation Limited issued no later than 1968. This historic document was printed by the Canadian Banknote Company and has an ornate border around it with the company's name on top center with an electron vignette. This item has the printed signatures of the Company's officers.